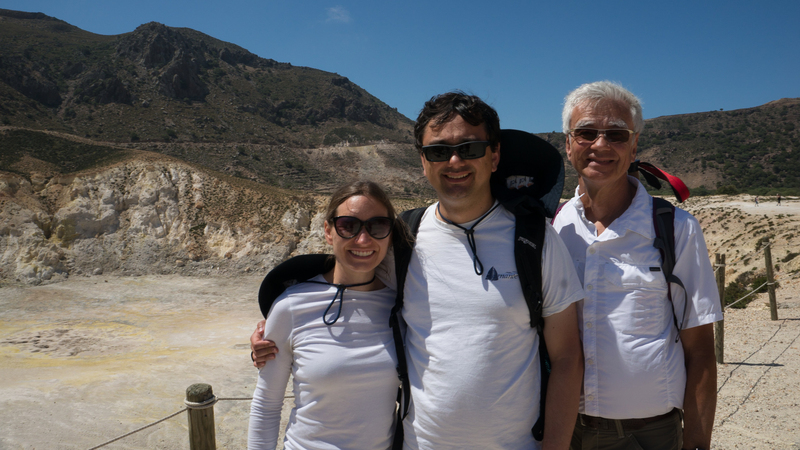 Our son and daughter-in-law, Matt and Emma wanted to hike up to the active caldera of the volcano at Nysiros, and we played along though we had no such desire, initially, having smelled enough sulfur to last a lifetime. We tried to anchor but couldn’t find calm water that was close to the departure point for the walk. The marina in Mandraki is about 10.5 feet deep near the wall, and with a bit of weather predicted, we went on to Kos. Amante draws over 8.5 feet and two feet isn’t enough comfort zone with a potential swell. 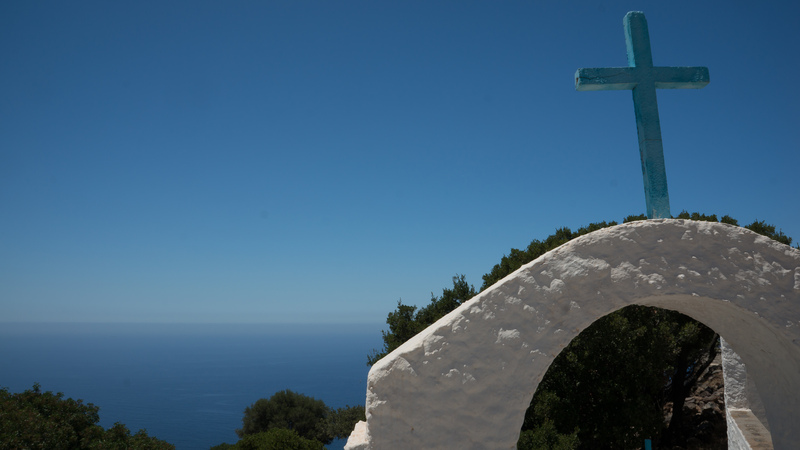 We anchored on the west end of Kos in a large bay I could have lingered in for a few weeks. We took a day trip boat from Kardamaina, a cute town with beaches, day trip boats and lots of holiday hotels and bars. Sit feels strange to get off our own boat onto a day trip boat, the very thing we spend lots of time trying to avoid. The day trip price included a bus trip up the mountain for the caldera hike and back, but we chose one way to walk back down the mountain. So glad Matt and Emma found this! 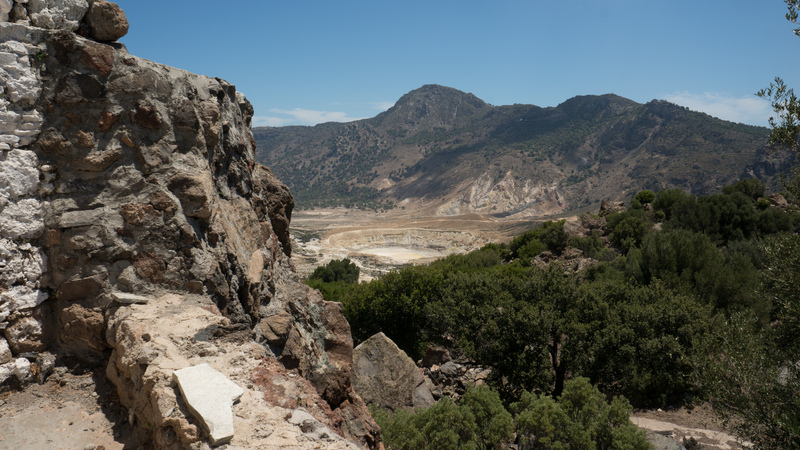 The volcano is currently inactive (whatever that means with smoking fuleroles), but the top still smokes with fumeroles and sulpurous mud pots and hot springs. This may be one of the most green, floral islands in the Dodecanese- at least of those I’ve seen. The volcanic soil is very fertile. Terraces of olive, fig and almond trees flanked the path down to the town of Madraki. 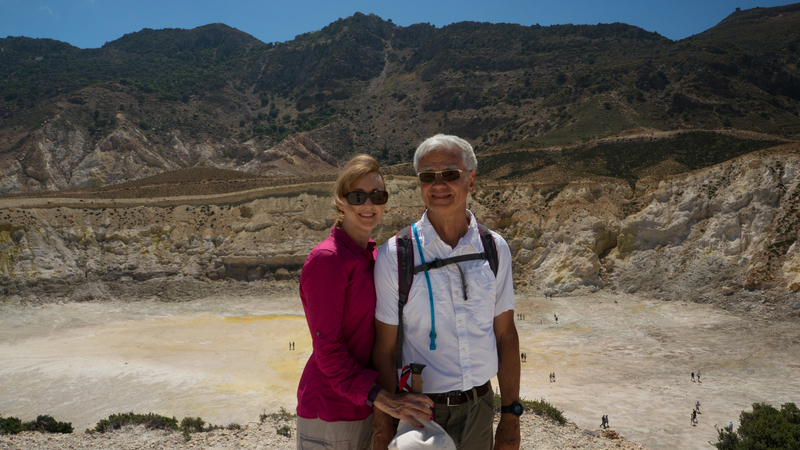 It was beautiful, even with the occasional whiff of sulfur, and the back-of-the-mind thought that we could break through the crust and be boiled alive in a hot spring. 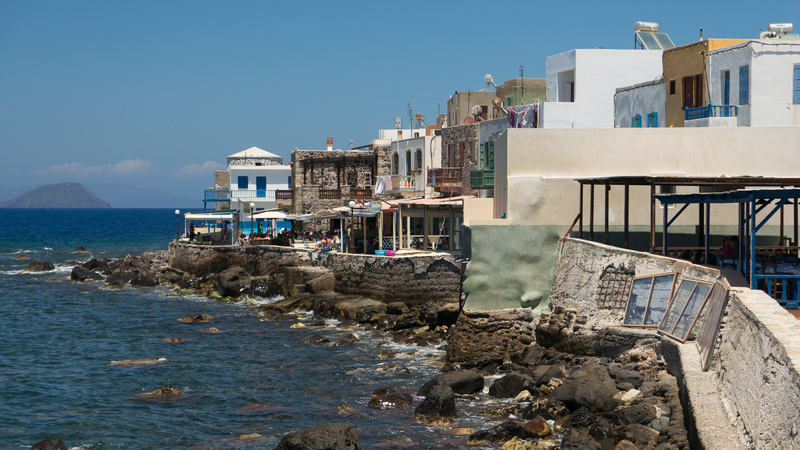 The town of Mandraki is one of the prettier seaside villages I have seen, where the entire town seems committed to a common aesthetic. 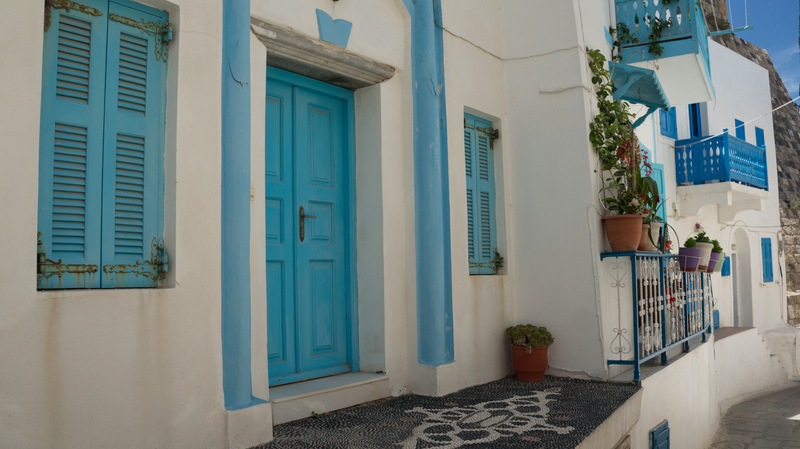 Pebble mosaics, whitewashed houses and ample bougainvillea make this town not only beautiful, but show communal attention and design. We had lunch literally “over the water” with the occasional wave splashing up. 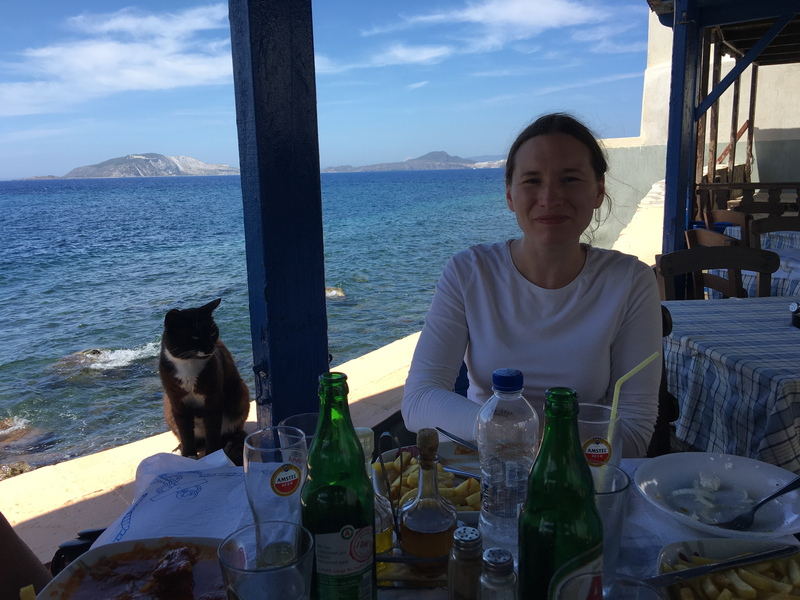 Emma learned the Greek cat trick- a cat will visit briefly when you sit down, so you still remember him when you have food to share. She was claimed by this one. World traveller, curious observer, quite likely to comment. This entry was posted in Uncategorized and tagged caldera, Cruising, cruising life, Greece, Nysiros, Sailing. Bookmark the permalink.